Turtle Trek is a new free game download for the iPhone and iPad and the first mobile game from SeaWorld. Players direct an adventuresome sea turtle on a quest across the beach and into the water to find friends. Like the attraction the game is based on, the user will guide the sea turtle through the perilous seascape and conquer a variety of challenges, some dangerous and some light-hearted. 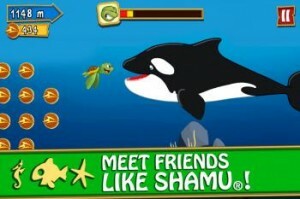 Along the way players will get help from friendly characters such as Shamu and Nyah, a green sea turtle featured in the attraction. Players attempt to collect treasures and fill virtual sticker books with an array of ocean friends met during their trek. Hopefully there is some educational benefit as players learn fun facts about real sea animals too. Players encounter dozens of sea creatures but when they meet a special “Ocean Friend,” they gain a collectible virtual sticker for their Trek Book. At the touch of a finger, this virtual sticker opens to reveal interesting facts and photos about the actual ocean animal that the character resembles. These facts are kept easily accessible and can be shared with family and friends. Turtle Trek continues SeaWorld’s effort to expand into a media and entertainment company. Joining the world of online games seems a logical step. Turtle Trek is now available for free from the App Store. If you try it out, leave a comment with your feedback.